Battle Ground Academy opened its doors as one of the first college preparatory schools in Williamson County in 1889. It first fielded a football team, organized by W.D. Mooney — one of the first headmasters — two short years later. The history of football in Williamson County, more or less, started with that first squad. Drawn from the hundred-or-so boys matriculating there, volunteers from the community sewed the Wildcats’ first uniforms. By the standards of today, their equipment was primitive, even appalling. According to a Monument to Education by Cindy Gentry, only heavy khakis with foot-long reeds inserted protected their legs. Cotton batting shielded knees, hips and shoulders. And no one wore helmets. The school colors, then, were purple and green. A student needed to be tough to play football during its infancy in the late 1800s. And the early BGA teams were indeed tough- to beat. At the time, high school football teams were rare. In fact, BGA was the first prep school in the south to field a team. University teams on its early schedules include Sewanee, Centre, Cumberland and the University of Nashville. The relationship between the Commodores and BGA started early. The legendary 1901 team beat Louisville, Indianapolis, Bowling Green and the University of Nashville- and practically every player on the roster went on to play for Vanderbilt. But for all its prowess, BGA could never get Vanderbilt to accept the challenge. “It is reported that Mooney offered five hundred dollars to whoever could get Vanderbilt to play, though the challenge was never accepted,” Gentry wrote. Meanwhile, the Wildcats won their first championship in 1901. One of the biggest games that year was on October 26, 1901, versus the Training High School of Indianapolis. The Training School reigned as the 1900 and 1901 Middle West Champions, culling its team from a student body of more than 1,000. BGA, on the other hand, rarely broke 120 students in a given year. The Vanderbilt University Athletic Association sponsored the game, which took place in its stadium. Tickets were sold for 50 cents each. The game, typical of those at the time before the forward pass, was a slugfest. BGA won 6-5 (touchdowns counted for 5 points then) on a missed Training School extra-point attempt. In the years after, football grew in Williamson County and the rest of the country, especially scholastically. A BGA game in the 1930s, according to Gentry, reportedly drew consistent crowds of 5,000 people or more. 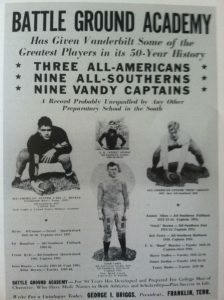 By the 1940s, BGA boosters printed posters touting the team’s contribution to Vanderbilt’s success. In its 50-year history to that point, BGA provided Vandy with three All-Americans, nine All-Southerns and nine team captains. In 1944, in the midst of a world war, BGA completed its first undefeated season, under the coaching of J.B. Akin, who introduced a T-formation offense. They finished the season 8-0. Reaching now into living memory, the decade of the 1960s brought about a golden age for Wildcat football. More than 28,000 fans attended the state championship Clinic Bowl in 1960 at Vanderbilt, where BGA played No. 1 ranked Isaac Litton High School. “The difference in the game proved to be BGA’s superior tackling as they went on to win 13-0 and Charlie Trabue was awarded as the Outstanding Player of the Game,” wrote Gentry. After outscoring opponents 362-46 and recording five shutouts in the regular season, the undefeated Wildcats faced unbeaten Crossville in the Hartsville Tobacco Bowl state championship game. Crossville’s defense allowed only 26 points leading up to that matchup. After the first quarter ended the teams were tied 7-7. “The turning point in the game was an incredible touchdown pass and reception from quarterback Brother Campbell to Robert Akin that ended the first half,” Gentry wrote. The Wildcats went on to win 43-7, firmly establishing the school’s spot as not only the oldest but also one of the best football programs in Williamson County.